George Brookes is a brilliant but reclusive plant biologist living on a remote Canadian island. After his mysterious death, the heirs to George's estate arrive on the island, including his daughter, her teenage children and Jules Beecher, a friend and pioneer in plant neurobiology. As Jules begins investigating the laboratory and scientific papers left by George, he comes to realize that his mentor may have achieved a monumental scientific breakthrough: communication between plants and humans. 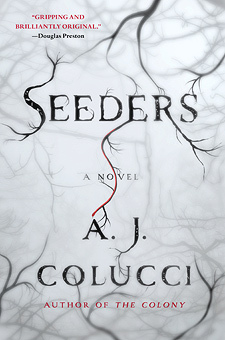 Within days, the island begins to have strange and violent effects on the group, especially Jules who becomes obsessed with George's journal, a strange fungus growing on every plant and tree, and horrible secrets that lay buried in the woods. A series of gruesome attacks have been sweeping New York City—three men are found dead, their bodies nearly dissolved from the inside out. The culprit is a supercolony of ants: An army of one trillion soldiers with razor sharp claws and flesh-eating venom. The desperate mayor turns to the greatest ant expert in the world, Paul O'Keefe, a Pulitzer Prize-winning scientist in an Armani suit. Paul is baffled by the insects and recruits the one person who can help, his ex-wife Kendra Hart. 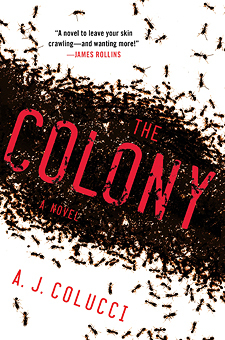 When the ants launch an all-out attack, Paul and Kendra hit the dangerous, panic-stricken streets of New York, searching for a coveted queen. It's a race to unlock the secrets of this indestructible new species, before the President nukes Manhattan. Read a Q&A with A.J. Site design © & maintenance by xuni.com. All content © 2012-2019, A.J. Colucci.